They look great Joanna, thanks for the tip about rolling/shaping on paper, I’m hoping to make these tomorrow! Hi Celia and C, look forward to seeing how you get on with this one! Aren’t they a beautiful colour! And just the right shape & size for our beef escalopes that we are having on the bbq tonight. They really do look good. I find buns to be one of the hardest breads to make uniform. Size isn’t a big problem if you weigh the dough, but shape always seems to go a little wonky. Yours look like buns- good job-! Ah ha, I can do round buns but all the other shapes, always come out a little ‘individual’ . Just for you Heidiannie, (everyone else look away) here is a shot of the barbecue breads with all their mountains and canyons as they came out of the oven. Sorry, I looked. But your photo made me feel much better! I stupidly did try and separate them, but I have another batch rising which I’ll score as you say. Either way, they were completely delicious – the boys absolutely wolfed them all down! When the dough is that wet, there really is nothing else you could do. Such a good idea, scoring them to pull/cut apart later. Maybe I’m making my dough too dry and that is why the rolls keep looking like giant puff balls even when I squoosh them down right before baking. I’m going to try this recipe next time. Even in the pan, yours still look better than the big roley-poley balls I keep making! And Dan has speedily answered Celia on his forum – ! Hooray! All is now revealed! Edit : April 2013 – Dan’s forum is now closed so from memory what he said was that one cuts through the dough to divide it into 8 pieces, but you don’t move them or separate them. I was right about the space constraints in the magazine wasn’t I? I’ve been reading that column in the Guardian for a long time now…. Expect to see brilliant buns on Fig Jam and Lime Cordial very soon. Look forward to seeing yours too Heidiannie! I’ve just seen these on Celia’s blog, so thought I’d better have a look at yours too. 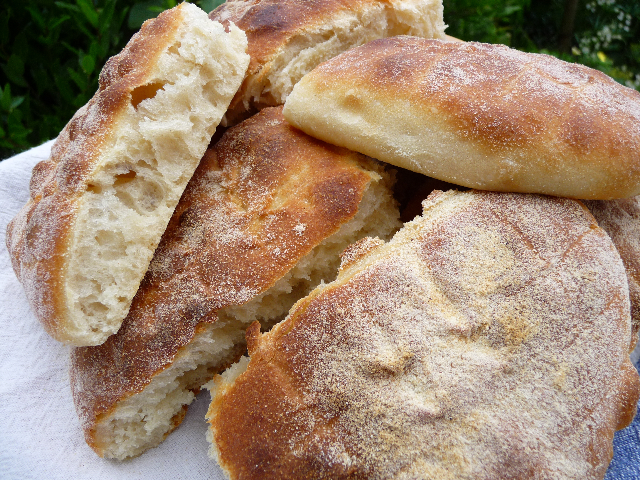 The dough looks as though it has a really nice texture and I can see they would be perfect for BBQs. I made these last weekend, right after I saw the recipe in my GR. They’re excellent with chicken salad. =) I’m glad I’m not the only one who had a bit of trouble figuring out what to do with the minimal shaping instructions. I did the same thing you did, cut through the dough but left it in place, then pulled the buns the rest of the way apart once baked. I’ll definitely be making these again soon! And I’ll have to check out the recipe for the soft white baps. 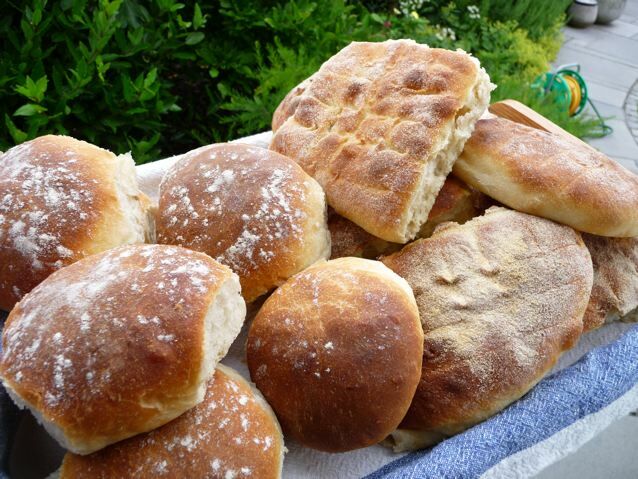 His buttermilk baps are a favorite of mine.